I've always wanted to experience and travel using prime cruises but never had the chance. That's why when I stumble upon a very good cruise deal, I know it's worth considering and worth sharing to my readers. Here's the deal from Superstar Virgo that is worth checking and trying. 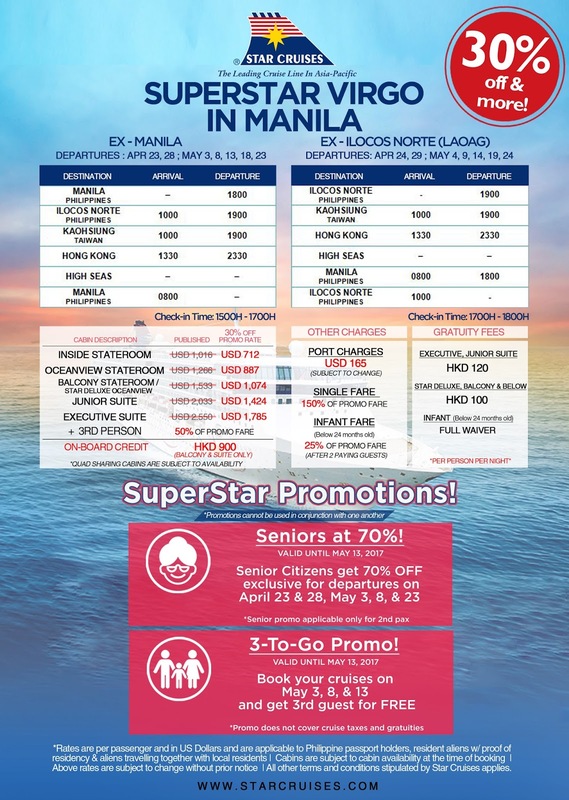 The promo and great deal is 6 Day/5 Night cruises departing from Manila, sailing to romantic Laoag, charming Kaohsiung, and the shopping Mecca that is Hong Kong and bring along your lolo or lola and avail of 70% off for Senior Citizens, exclusive for May 3, 8, and 23 departures. 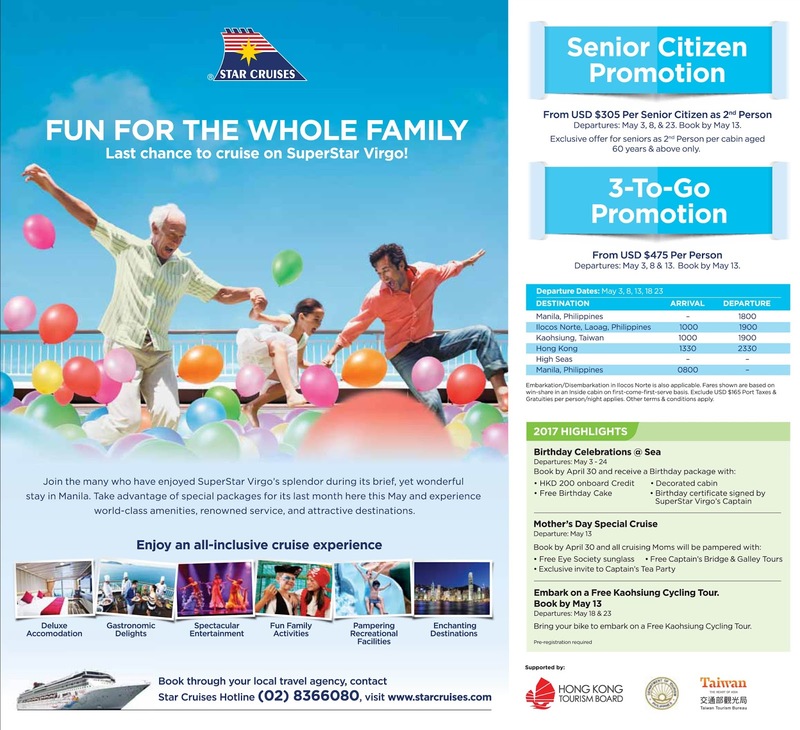 Promotion is exclusive for guests counted as 2nd person for 60 years old and above, as low as USD $305! Star Cruises is a wholly-owned subsidiary of Genting Hong Kong, a leading global leisure, entertainment and hospitality corporation. A pioneer in the Asia Pacific cruise industry, Star Cruises has been operating its fleet since 1993, taking on the bold initiative to grow the region as an international cruise destination with a fleet of six vessels including SuperStar Virgo, SuperStar Libra, SuperStar Gemini, SuperStar Aquarius, Star Pisces and The Taipan. Star Cruises' commitment in offering best-in-class services and facilities is reflected in a host of recognitions and accolades received over the years. These include being inducted into the prestigious Travel Trade Gazette's "Travel Hall of Fame" for a ninth year in 2016 in recognition of winning "Best Cruise Operator in the Asia-Pacific" for 10 consecutive years. Star Cruises was also recently voted "Asia's Leading Cruise Line" at the World Travel Awards for a fifth year in a row in 2016.